A slice is created by a large difference in the face-to-path relationship. 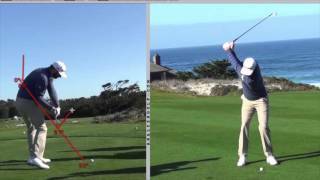 For a right handed golfer, the path is more to the left than where the face points at impact. To solve this pattern, you will need to move the path more to the right and close the face to the path. The path fix tends to open the face, so it is usually a best practice to work on learning to close the face with shaft rotation before trying to fix the path.